Detail of NOAA map showing disasters with costs of $1 billion or more in 2016. Full map below. 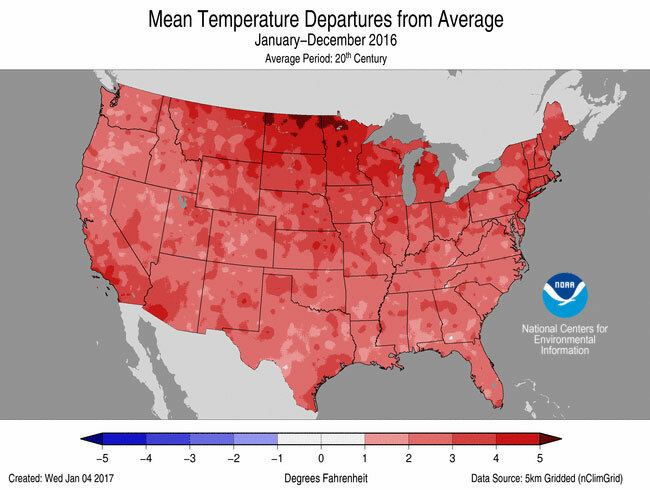 2016 was the second warmest year on record (since 1895) in the contiguous 48 states. It was Texas’ third warmest year on record, and the state was impacted by nearly half – seven of 15 – of 2016’s most costly weather and climate disasters. Those and other details were included in federal scientists’ annual State of the Climate report, released this week by the National Oceanic and Atmospheric Administration (NOAA). 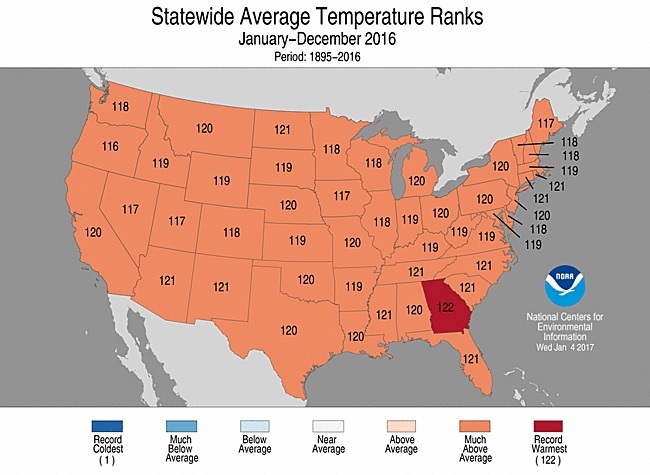 All states experienced above-average temperatures, compared to their 20th century averages. Climate scientists have said they expect global analyses by scientific teams in different nations will show 2016 was the warmest year worldwide. One such assessment has already reached that conclusion. 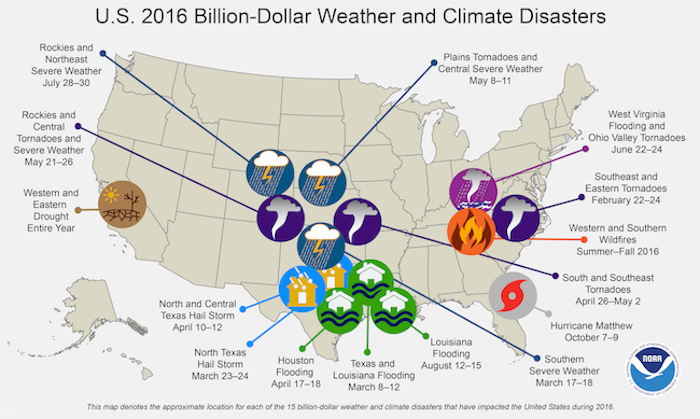 NOAA reported that there were 15 weather and climate disasters with losses of at least $1 billion, making 2016 the year with the second highest number of such events (2011 still ranks No. 1 with 16). The total financial toll of the billion-dollar disasters last year was $46 billion. They claimed 138 lives in all. Scientists say human-caused climate change has already caused increases in the number and severity of some extreme weather events. Analysts expect their impacts to increase as climate change accelerates and social and economic trends, such as population growth and development in vulnerable areas, progress. For historical context, the NOAA report included statistics and the following map to portray how states have been impacted differently by billion-dollar disasters. 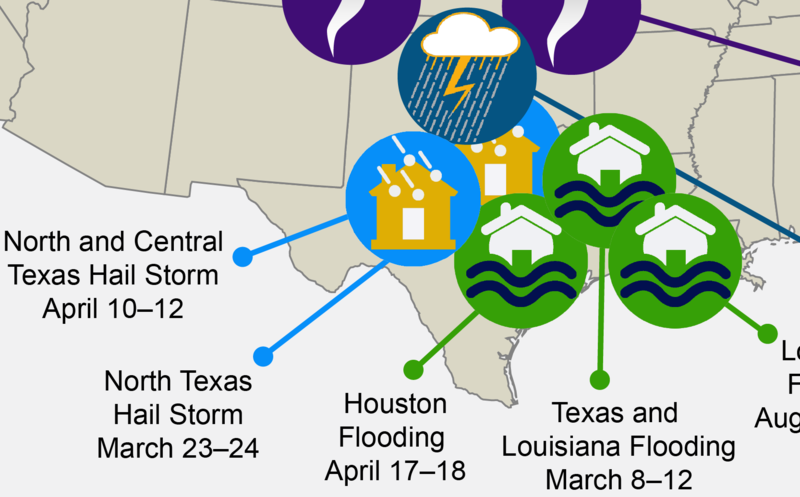 From 1980-2016, the period for which the agency maintains records for such events, Texas experienced 84 disasters with costs of $1 billion or more, the most among the 48 states. 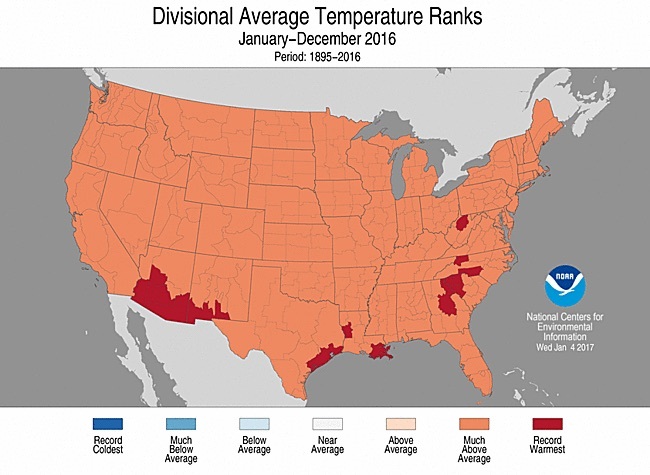 It was the warmest year on record for a 13-county area along the Upper Texas Coast, one of the National Weather Service’s nine multi-county “divisions” in the state. 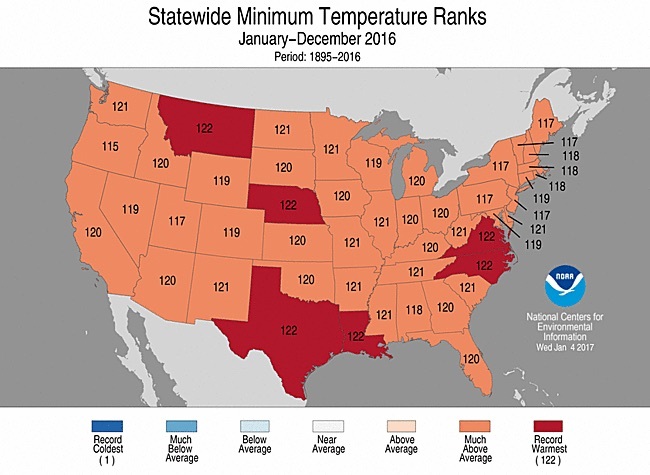 Texas was one of five states with minimum average temperatures in 2016 (averages of their daily low readings) that were their respective record warmest. Increasing nighttime temperatures, a projected consequence of manmade global warming, are expected to pose growing risks for human health, agriculture and power grids. 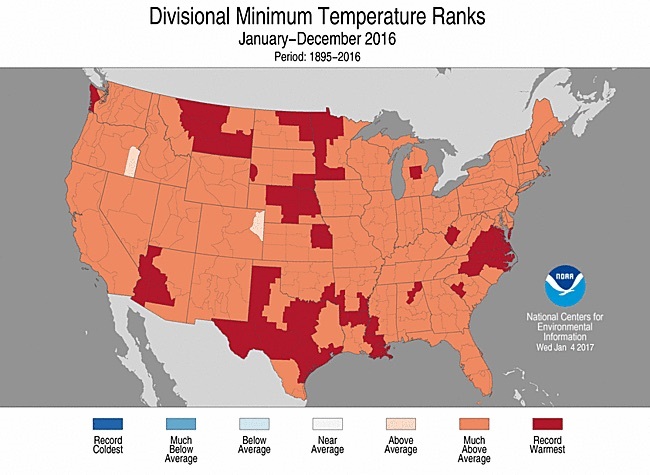 Six of the Weather Service’s nine divisions in Texas had average minimum temperatures that set new warmth records for those areas of the state. 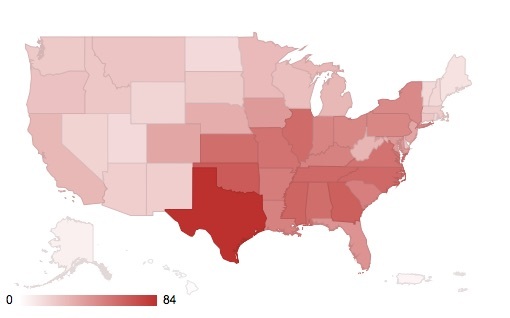 The rest of Texas had average minimum temperatures “much above average,” as the map below shows.